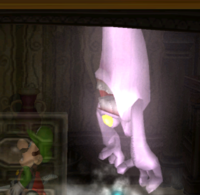 Ceiling Surprise is a smiling light pink ghost that hides on the ceiling, and drops down to startle Luigi in Luigi's Mansion. It is generally coupled with another common ghost, usually Bowling Ghosts. Ceiling Surprises are extremely weak with zero HP, and are guaranteed to always drop a ten- or twenty-HP restoring Heart when captured, but will not if they are defeated via elements. Ceiling Surprises will keep returning in Area 2 and 3 until the area is complete. They have a variant called Purple Bombers. One of them appears in the well and must be captured to get the key to the Rec Room. They are the weakest ghosts in the entire game, as they have 0 HP, and have no way of damaging Luigi. Creepers from Luigi's Mansion: Dark Moon have a similar attack strategy to Ceiling Surprises. This page was last edited on October 20, 2018, at 20:08.